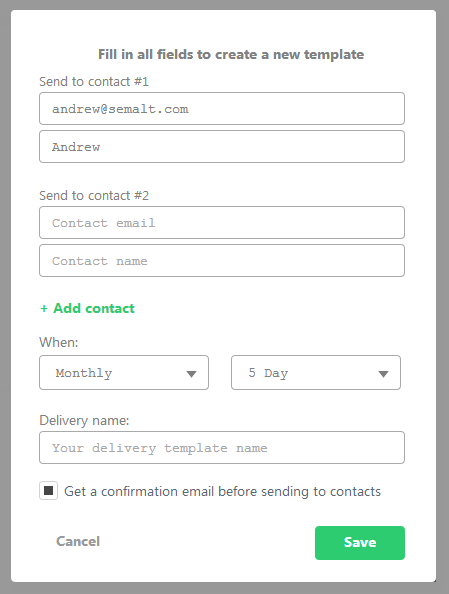 Create your own email delivery templates for your Semalt reports. Automated delivery of web analytics reports saves your time and efforts. You can receive ready reports at the specified email and create a list with contacts. You can preview the data and confirm the delivery to other contacts. If you want to customize the report delivery process you should follow our recommendations. Send to contact #1. This field shows your details. Click Remove contact to delete this information. Send to contact #2. Email of a new recipient. Add contact. Add new recipients. monthly. If you select weekly/monthly delivery, you need to choose a day. In order to preview the reports before sending to other contacts check the box “Get a confirmation email before sending to contacts”. Send to contact. List of recipients. When. Frequency of the report delivery. Confirmation. Enabled/ disabled email confirmation. I have accidently deleted an email delivery template. Can I restore it? Unfortunately, you cannot restore the deleted template. You need to create a new template and make all the necessary configurations. How can I confirm the delivery to other recipients? You will get a message from the Semalt Report Center to your email. Click Download Report if you want to preview a report before sending it to other contacts. In order to send a report to the selected contacts, click Confirm report delivery to contacts. 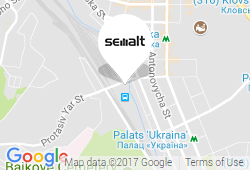 The report will be sent and you will see the Semalt notification: Successfully sent to the contact(s). How many contacts can I add to the email delivery list? The number of email addresses is unlimited.